To make a gore skirt, is a good choice in many ways. It is simple and elegant. The way its pattern is shaped, eliminates excess fabric at the waist line while still provides fullness at the hem. Choose proper length for your skirt and you will have your favorite garment which makes you slender and tall, provides feeling of comfort and complete freedom of movement. A gore skirt pattern fits very well for crocheting or knitting project and is easy to do. You can use a basic block (check a link to a Skirt Pattern page at the bottom of this page), to make a skirt pattern. Nevertheless, the easiest and the most universal way to do it is described below. You can make any number of gores for your skirt pattern. How many? It doesn't matter. You are not going to knit or crochet any of them. -:) All you need is a sketch that has dimensions on it calculated according to the measurements of your body. As an example, we will draw a skirt with 4 gores . 1. A skirt pattern is designed for the knitting or crochet projects only. Don't use it for the sewing skirts. 2. It is easier to draw a pattern in centimeters than inches. You will have to take 3 measurements (see Skirt Pattern page for reference). .
1. Hip circumference HC = 102 cm (40 in). 2. Waist circumference WC= 72 cm ( 28 in). Step 2. Draw a pattern. A. Draw a horizontal line A1A3. It will be our Waist Line. B. Draw a Center Line A2K1 perpendicular to the line A1A3. A2H3 = HC / 6 = 102 cm / 6 = 17 cm (40 in). A2K1 = SL = 65 cm (26 in). A1A2 = A2A3 = A1A3 / 2 = 9 cm (3.5 in). H1H2 = 102 cm/ 4 = 25.5 cm (10 in). H1H3 = H3H2 = H1H2 / 2 = 12.75 cm (5 in). G. Draw a line through the points A1 and H1. Extend the line till it intersect a Hem Line at point K4. Do the same symmetrically for the right part of the pattern and find point K5. I. Make a hemline curve. From the point A1 as a center draw an arc and find point of intersection K6. Radius of the arc is equal to the distance A4K1 = SL - 0.5 cm. A4K1 = 65 cm - 0.5 cm = 64.5 cm. K. To finish the pattern, connect all points located along the red line on the picture. 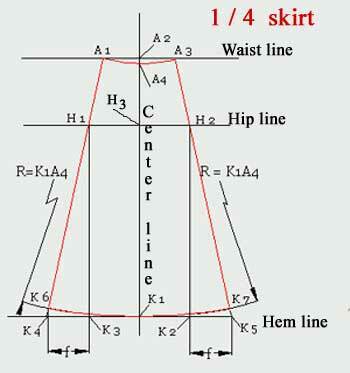 If you would like to change fullness of a skirt at the hem line change the distance "f" to the desired magnitude. A pattern is ready. It is time to knit or crochet a gore skirt. Follow the steps described at the Gored Skirt page.